Chicken and pasta is a classic meal combination. 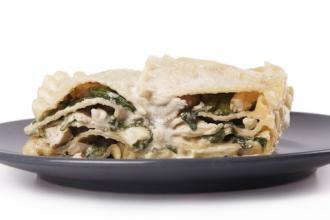 Because of its mild flavor, chicken holds up well in a number of exciting pasta dishes. This chicken version of lasagna is creamy and delicious. Add onion and cook until soft, about four minutes. Add flour and salt and cook, stirring constantly, for two minutes. Whisk in milk and chicken broth. Bring to a boil and cook, stirring constantly, until it begins to thicken, about one minute. Stir in one cup of mozzarella cheese, 1/4 cup of Parmesan cheese, and oregano. Cook, stirring constantly, until cheese melts and sauce is smooth. Spread 1/3 of the sauce in the bottom of a 9x13 pan. Layer three lasagna noodles on top of the sauce. Mix cottage cheese and spinach in a small bowl. Spread half the spinach mixture atop the noodles. Spread half the chicken on top of the spinach mixture. Sprinkle with 1/3 of the remaining mozzarella and Parmesan cheese. Top with the second third of the sauce. Repeat steps 10 through 14, except for step 11, as the spinach and cheese are now mixed. Layer three more noodles on top of the cheese and pour the remaining sauce over the noodles. Sprinkle the top with the remaining mozzarella and Parmesan cheese. Place the lasagna in the preheated oven and bake until for 55 minutes, until cheese is bubbly, noodles are soft, and casserole is hot. 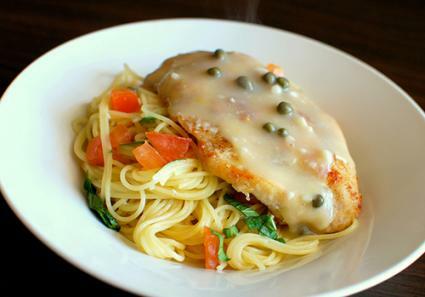 Chicken piccata is a nice, light, acidic dish that combines perfectly with delicate angel hair pasta. Enjoy with a glass of Pinot Grigio. Whisk together flour, pepper, and paprika. Dredge chicken breasts in flour mixture, tapping to remove excess. Heat olive oil in a large sauté pan over medium-high heat until it shimmers. Remove the garlic from the oil with a slotted spoon and set aside. Add two tablespoons of butter to the sauté pan and heat until it bubbles. Cook chicken in the butter until it browns slightly and is cooked through, about five minutes on each side. Remove the chicken from the pan and set aside on a clean platter. Add the wine to the pan, scraping any cooked on bits of chicken from the bottom of the pan with the side of the spoon. Simmer until wine reduces to about a half cup. Stir in chicken broth, garlic, lemon juice, and capers. Simmer over medium-high heat for about five minutes until it slightly thickens. Whisk in remaining two tablespoons of butter and parsley. Toss sauce and reserved chicken with hot pasta and serve immediately. 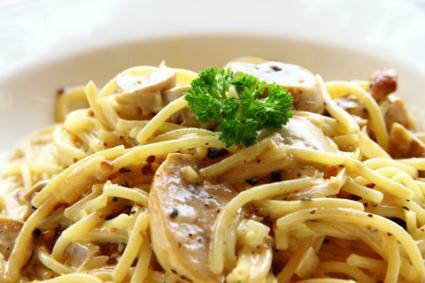 Spaghetti carbonara is a classic Italian bacon and eggs pasta dish. The addition of chicken makes it slightly heartier. In a large sauté pan, cook bacon over medium high heat until fat is rendered and bacon is crispy. Remove bacon from the fat with a slotted spoon and set aside. Cook chicken breasts in bacon fat until juices run clear, about five minutes per side. Remove chicken from fat and set aside on a clean plate, tented with foil. Remove all but one tablespoon of bacon fat from the pan. Cook garlic in bacon fat until it is fragrant, about 30 seconds. Stir in white wine, using the side of the spoon to scrape up any browned bits from the bacon and chicken on the bottom of the pan. Simmer until thickened, about two minutes, and then remove from the heat. In a medium bowl, whisk together eggs and Parmesan cheese. Slowly in a very thin stream, pour wine mixture into egg mixture, whisking constantly. Toss chicken, sauce, and hot spaghetti. Serve topped with additional cheese if you wish. With your chicken and pasta dishes, all you need is a simple green salad or some fruit to make a delicious meal. Since most of these recipes come together fairly quickly, they make a great weeknight family dinner.